We’re the Apartment Acquisition Experts! At SVN Rock Advisors, As apartment acquisition experts we have spent years building a database of every apartment building in Ontario for all types of apartment acquisition. It allows us to pinpoint who owns what and to locate any apartment building anywhere in Canada. If you know what you are looking for, we can help you find it. We will leverage our in-depth research and extensive property database to identify your target segment. We have access to information and industry influencers others simply do not. Helping you purchase raw land or buy a newly-developed purpose-built rental, we will use this access to your advantage. Let’s say you wanted to acquire an apartment building near a university because you are a student housing specialist, you would punch in the postal code for say, McMaster University, and up would come all the apartment buildings close by. Or maybe you think Starbucks always picks good neighbourhoods to open stores in, you could punch in the address of every Starbucks and find the buildings closest to their locations. It’s an invaluable tool to serve our clients both in acquisition and disposition of apartment buildings. Are you a purpose built apartment developer looking for an acquisition of the apartments with the best location in town? We have you covered. 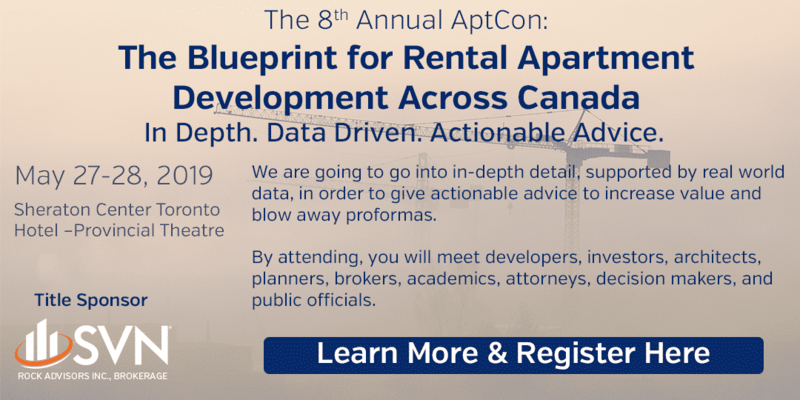 The most significant challenge faced by growing companies in the Canadian apartment industry is a lack of apartments to acquire. For example, institutional buyers like to buy larger buildings and there simply aren’t that many available to buy in Canada. If a buyer wants to focus in on buildings of 200 units or more, he will find the following market: Ontario – 482 apartment buildings; Toronto – 176; Montreal – 103; Ottawa – 80; Hamilton – 31; Winnipeg – 13; Edmonton – 23; Calgary – 35; Vancouver – 25; and London – 18. As a result, larger owners need to move down-market and buy smaller buildings. With this in mind, we encourage our clients to buy in clusters, i.e. four 50-unit apartment buildings close together can be treated as one 200-unit complex. This section of our website is tailored to investors. Here, we offer you our expertise on the best and worst places to acquire apartments. You will learn more about our acquisition-side brokerage method, and how that puts you in the driver’s seat in getting the apartment property you want. If you are interested in investing in the purpose-built apartment industry, draw on our years of experience.